This rare phenomenon refers to contacting occlusal surfaces of impacted permanent mandibular molars with roots pointing in opposite directions. In scientific literature the condition of impaction is called "kissing molars". The most affected ones are the mandibular second and third molars. The aetiology is still unknown. A 58-year-old female with an already opened submucosal abscess in the right lower jaw was referred to the Oral and Maxillofacial Department of the University of Münster. The orthopantomogram revealed bilateral kissing molars between teeth 47/48 and 37/38. Additionally, large radiolucent areas surrounding the crowns of the teeth indicated two follicular cysts. The panoramic radiography showed that the teeth were in close vicinity to the mandibular canal. But the digital volume tomography (DVT) revealed no contact of the roots with the canal. The lingual and vestibular cortical of the mandibular showed only punctual destruction. After an abscess incision and drainage, surgical removal was planned. We surgically removed the 4 kissing molars under general anaesthesia. The bone defects were filled with collagen. The histopathologic analysis confirmed the presence of two follicular cysts. The term "kissing molars" refers to impacted mandibular molars with contacting occlusal surfaces. The bilateral occurrence of this phenomenon is extremely rare. Indications for surgery involve a history of recurring infections and pain or cystic lesions associated with dental inclusions. The mandible or submaxilla is a 'U' shaped pivotal structure, considering the attachment of the muscles of mastication with relation to mastication itself. The coronoid process is a variably shaped beak-like projection at the anterosuperior aspect of the ramus, the anterior border of which is convex and continuous with the ramus. Posteriorly, the border is slightly concave and contributes to the mandibular notch. The entire border of the coronoid along with the medial surface provides attachment for the temporalis muscle. Previous studies have shown that the size and shape of the coronoid are co-related to the bite force required by an individual and is dependent upon the mechanical force acting upon it during development. However, little is known about the developmental program leading to the specification of the process. The relative shape and size of the coronoid process varies considerably across individuals. 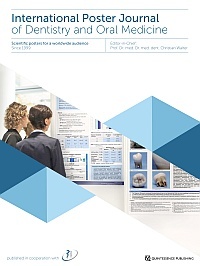 The author in this poster aims to present his unique discovery of 'Coronoid Foramina' bilaterally along with bilateral accessory foramina over the lateral aspect of the mandibular ramus, which has never been seen or documented in literature to date. Objectives: To assess and compare the antibacterial efficacy of 4% Tulsi, commercially available fluoridated (Colgate total care) and placebo dentifrices on salivary Streptococcus mutans counts among 14-15-year-old school children in Davangere city. Materials and methods: A triple blinded randomised controlled trial with a study population of 14-15-year-old school children. A sample of 84 participants was randomly selected and 2 ml of unstimulated saliva was collected. Microorganisms were cultured using Mitis Salivarius selective media. The participants with a 105 colony-forming units (CFU) were considered as eligible. Block randomisation and concealed randomisation methods were adopted to allocate the participants into three groups containing 28 each. After seven days, a post assessment of salivary Streptococcus mutans count was done. Wilcoxon signed rank test for within group comparison and Kruskal Wallis ANOVA for intergroup comparison were used. Results: The study showed a significant reduction in salivary Streptococcus mutans counts from baseline to post-test (mean rank 37.95 - 25.27) in the Tulsi dentifrice group. The intergroup comparison showed a statistically significant difference (p=0.044). Post hoc analysis showed a statistically significant difference between the Tulsi and placebo dentifrice groups (p=0.026). Conclusion: 4% Tulsi extract incorporated in the form of dentifrice have shown a maximum reduction in the salivary Streptococcus mutans count, for a period of seven days when compared to fluoridated dentifrice. Objectives: A total blood analysis is frequently used to assess the presence of infection or inflammation. Various studies have elucidated that periodontal infections affect hematological parameters such as the differential counts of white blood cells, red blood cells, and/or platelets. Early onset of disease, its rapid rate of progression, the nature and composition of associated sub gingival microflora, and a familial aggregation of diseased individuals distinguishes aggressive periodontitis from chronic periodontitis. There is scarcity of data regarding the effects of generalised aggressive periodontitis on erythrocyte counts and other parameters of anemia. The present study is being undertaken to determine whether generalised aggressive periodontitis is associated with reduced erythrocyte counts and reduced hemoglobin levels. Material and Methods: The present study was undertaken in the Department of Oral Pathology and Microbiology. A total of 38 patients participated in this study. Erythrocyte parameters (values of white blood cells, red blood cells, hemoglobin, MCV, MCH, MCHC, red-cell distribution width, platelets, and mean platelet volume) and clinical parameters were recorded. Results: There was a positive correlation between increased values of mean RDW-CV in aggressive periodontitis and generalised chronic periodontitis case in comparison to the control group. No significant difference was observed between the mean values of MCH and MCHC among the three groups, whereas MCV was significantly lowered in aggressive periodontitis patients. Conclusion: More studies on a large scale need to be done in order to find the association of RDW with aggressive periodontitis patients. Wan Bakar, Wan Zaripah / Sajjad, Arbaz / Mohamad, Dasmawati / Kannan, T. P.
Glass ionomer cement (GIC) is among popularly used materials in prosthodontics for core build-up and cementation of prostheses. A novel GIC-nano Zirconia- Silica- Hydroxyapatite (GIC-nano ZrO2-SiO2-HA) has been developed which has better hardness and aesthetics. Aim: To characterisze and evaluate the fluoride release and colour stability of a new GIC-nano ZrO2-SiO2-HA hybrid material. Materials and Methods: The nano ZrO2-SiO2-HA was synthesiszed using modified sol-gel technique, and the nanopowder was characterized using TEM and FTIR. Ten samples per group were prepared by adding 5% by weight of nano ZrO2-SiO2-HA powder into the conventional GIC (Fuji IX). The colour stability was measured with a spectrophotometer using the CIE L*a*b* system, and the fluoride release was measured using an ion- specific electrode (ISE) meter, over a one-month period. The data wereas statistically analysed using repeated measures ANOVA. Results: TEM micrographs confirmed that all particles were in the nanoscale range with spherical ZrO2 and SiO2 particles embedded in the voids between rod-shaped HA crystallites. FTIR confirmed the presence of functional groups corresponding to each element. The statistical analysis demonstrated that the ΔE values for GIC-nano ZrO2-SiO2-HA were lower than for conventional GIC, indicative of greater colour stability, and fluoride release was significantly higher for all the time intervals (p<0.05). Conclusion: The addition of nano ZrO2-SiO2-HA has improved the physico-chemical properties of GIC with greater colour stability and fluoride elusion, making it a potentially stronger anticariogenic aesthetic dental material for the future. Background: Benzodiazepines may be prescribed for anxiolysis to aid a patient's journey in the hospital setting. The purpose of this audit was to assess the safety and efficacy of oral diazepam as a pre-attendance medication prior to admission for dental treatment under general anaesthesia. The benchmark based on pre-determined guidelines was set so that 100% of those taking the pre-medication suffered no adverse effects with a safety of 100%. Efficacy of the medication was established at ≥80%, so that ≥80% of those who took medication benefited from its anxiolytic action. Methodology: This was a retrospective audit of patient discharge letters from the period 2013 to 2017 inclusive. The sample size was 71. Data points related to demographics, prescription details, safety, and efficacy. Inclusion and exclusion criteria were established. The data were analysed and results formulated. Results: Of the 71 records initially selected, seven were excluded for reasons including failure to take medication or failure to take the prescribed dose. Of the 64 patients, the safety of oral diazepam was excellent at 100%. Of the 64 remaining records, 21 were not included as efficacy was not documented. Full efficacy as a sedative and anxiolytic of the remaining sample were recorded at 75%. In 23% of cases, it was deemed somewhat effective or to have mild sedative effects. In 2% of cases, it was reported as ineffective. Of the total sample size, an additional premedication was required in 69% of cases, 16% did not require an additional pre-medication, and in 16% of cases it was not recorded. Conclusion: Oral diazepam as a pre-medication prior to hospital admission was found to be safe with no adverse reaction recorded. Full efficacy was close to achieving the desired benchmark. The use of oral diazepam does not negate the need for additional pre-medication in the majority of patients. There is a need for improved documentation and a more objective evaluation involving a multidisciplinary approach. Introduction: Glass ionomer cements are used for many clinical applications in dentistry due to their self-adhesive, anti-caries, and good biocompatibility properties. Despite the advantages, their main disadvantage is that it has low strength. Objective: To evaluate and compare material characterisation, surface hardness, compressive strength, and flexural strength of material following the addition of nano-hydroxyapatite-silica into conventional glass ionomer cement (GIC) matrix. Results: FTIR and XRD analysis confirmed the formation of hydroxyapatite-silica nano-particles. SEM and TEM images showed all hydroxyapatite crystals were elongated and covered by smaller silica particles. The nano-powder consisted of a mixture of spherical silica particles (50 nm) and elongated hydroxyapatite particles in the range between 100-200 nm. The hardness, compressive strength, and flexural strength of nano-HA-35SiO2-GIC was statistically higher than nano-HA-21SiO2-GIC and nano-HA-11SiO2-GIC. The highest values for hardness (64.77 6.18), compressive strength (143.42 13.94 MPa) and flexural strength (17.68 1.81 MPa) were recorded upon the addition of 10% nano-HA-35SiO2 to GIC, an increase of ∼36%, ∼19.7%, and ∼53.34% respectively as compared to conventional GIC. Conclusions: The addition of nano HA-silica to conventional GIC significantly enhanced the mechanical properties of the material. Hence, it can be suggested as a potential dental restorative material in dentistry. Background: Oral squamous cell carcinoma is frequently preceded by clinical Oral Potentially Malignant Disorders (OPMDs) that correspond with an increased risk of cancer. Early recognition and diagnosis of OPMDs by means of screening can help in early diagnosis and, hence, improve patient survival, reduce treatment-related morbidity, and improve quality of life. The purpose of this study is to evaluate OPMDs with autofluorescence, reflectance spectroscopy, and vital staining and correlation with histopathology. Materials and Methods: Patients with OPMDs visiting the Department of Oral Medicine and Radiology BPKIHS were included in the study. After oral examination, screening was done by Identafi®, followed by toluidine blue staining, and then screened again by Identafi®.Then, incisional biopsy under local anesthesia was performed from the site showing positive change. Lesions that display a loss of autofluorescence (LOA) were considered to be positive, and lesions that display no LOA were considered negative. Lesions with diffuse vasculature were considered to be positive, and lesions without visible vasculature or with vasculature similar to the surrounding mucosa to be negative. Results: Of 10 patients (13 lesions), toluidine blue staining was positive in 46.15% (6 cases) of the cases and negative in 58.33% (7 cases). Diffuse vasculature was seen in 46.2% (6 cases), and vascularity was not appreciated in 53.84% of cases (7 cases). Identafi's violet light showed sensitivity of 85.7% and specificity of 50%. Conclusion: Identafi® is highly sensitive in detecting true positive cases. The sensitivity of white, violet, and green light are 100%, 85.7%, and 100% and specificity 100%, 50%, and 76.9%, respectively. The sensitivity and specificity of toluidine blue obtained was 66.66% and 100%. Since this is a pilot study, there is a need for further samples before making any concrete inference. The screening of OPMDs will help in early diagnosis and further help in selecting the biopsy site followed by proper early intervention, thereby increasing the prognosis, and outcome and decreasing complication associated with it. Objectives: The per-patient number of dental implants is increasing year after year. This study summarises the implant complications that occurred in a university hospital's dental emergency service in a four-year period. Methods: The data of four years (01-01-2010 - 12-31-2013) were analysed retrospectively. In this time period, 16,296 patients sought treatment in the dental emergency service. The Chi-square test was used to detect significances. Results: Out of all 16,296 emergency service patients, 0.6 % (n=94) came due to problems with one or more dental implants. Significantly more women (n=53; 56.4 %) were affected (p=0.023). The median age was 54.5±16.2 years. Implants in the lower jaw were distinctly more often the reason for the visit; the most frequent diagnosis was periimplantitis (31.9%; n=30), followed by damage or loss of the supraconstruction (20.2 %; n=19). 70.2% (n=66) of the affected implants were inserted alio loco versus 25.5% (n=24) in domo. Most complications occurred less than one year after implantation (n=11; 11.8%). Problems due to implants that were in situ more than one year (n=6; 6.5%), more than two years (n=4; 4.2%), or more than three years (n= 1; 1.1%) were less frequent. Conclusions: Problems with dental implants remain a rare reason for visiting the dental emergency service. Periimplantitis rarely leads to pain; nonetheless it was the most common implant problem in our study. The fact that women are affected significantly more often as well as that implants in the lower jaw cause problems significantly more often could be of interest in terms of possible causes. Objective: The purpose of this study was to describe and analyse cephalometric floating norms to describe the individual incisors' position dependent on the sagittal and vertical skeletal pattern of Chinese people. As well, a soft tissue evaluation relating to the incisors' position and skeletal values was carried out. By using Chinese cephalometric data, these findings can give a prognosis in treatment planning for this population. Material and Methods: 139 cephalometric x-rays from Chinese people undergoing orthodontic treatment at the University of British Columbia, Canada, were landmarked. They were separated into females aged under and over 18 years as well as males under and over 18 years. Each picture was analysed with 40 landmarks, in which eight cephalometric values (ANB, H-angle, 1NA(°), 1NB(°), 1NA(mm), 1NB(mm), PgNB(mm), Index) were digitised. By using the linear and multiple regressions equation, a schema for the ideal incisors' position and nomograms were constructed. Results: The eight variables correlated significantly with each other. In imitation to STEINERs "acceptable compromises", a schema for ideal upper and lower incisors' position was constructed. By using the multiple regression equation, two different nomograms were drawn. Chinese people have more proclined incisors dependent on their sagittal and vertical skeletal pattern. A soft tissue evaluation was given with the H-angle. Conclusion: Different ethnic groups vary in their skeletal and dental values.